This is the photograph of Palm Cockatoo (Probosciger aterrimus) that was made by a Belgian visitor in Tambrauw Mountains. The bird has got black feather with red cheek. 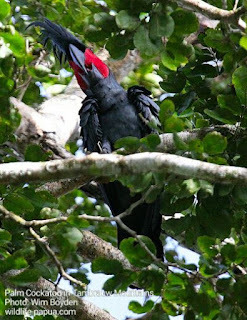 In West Papua and other parts of eastern Indonesia, the bird is called Kakatua Raja (meaning King Cockatoo). 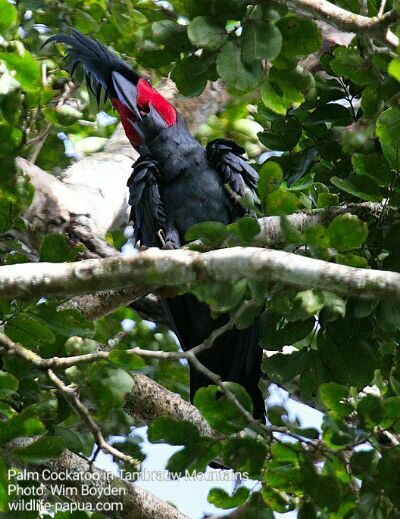 The bird eats tropical fruits and is considered as an important seed disperser for New Guinea rainforest. If you are interested in watching Palm Cockatoo and other birds in Tambrauw Mountains, please, contact me by e-mail to: peace4wp@gmail.com or whatsapp: +6281332245180.